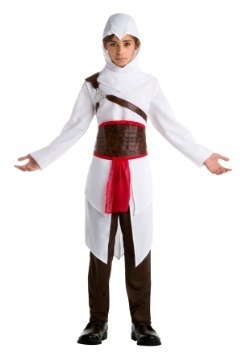 Assume the role of Desmond Miles and channel the strengths of your assassin ancestors to locate the "Pieces of Eden" in our licensed Assassin's Creed costume for adults. 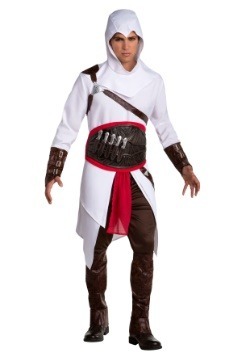 You can attend your next celebration as a real life version of your favorite video game character in this detailed costume from Assassin's Creed! Abstergo may be the secret form of the Templars in this modern era, but their technology certainly makes it possible for us to have that vicarious thrill of seeing what our genetic ancestors went through. And, better yet, it has given us some astounding inspiration for amazing historical costumes that will help you make history again! 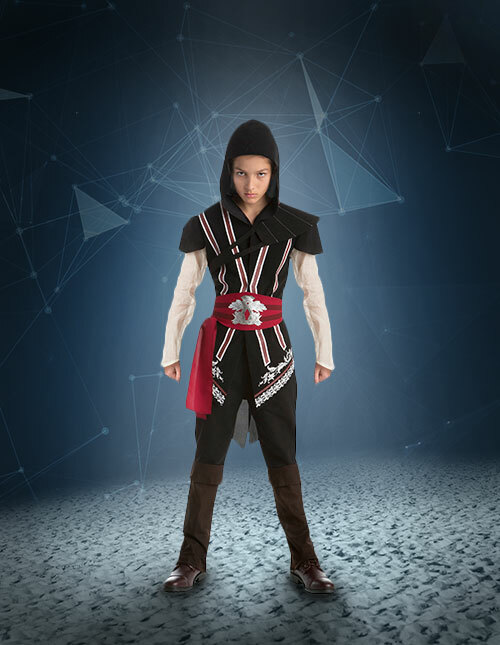 Whether you're looking to jump into the animus yourself or just enjoy some real-world journeys through Ubisoft's historic and magical world, we have all Assassin’s Creed costumes that you could hope for! Which era of Assassin's Creed will you explore today? Each era of our history has given us the peculiar protection of the Assassins. Whether you're talking about the unity of joining the Assassins Brotherhood in France or Italy, or perhaps seeing what life might be like in the early Americas, the options might feel a bit daunting. But fear not. 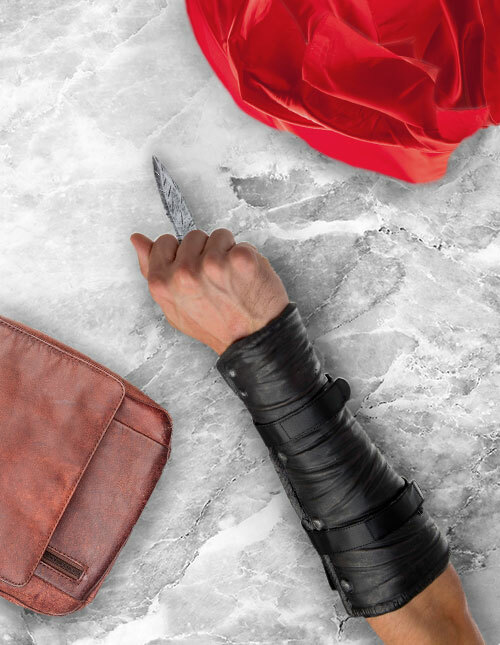 The origins of the Creed show that a few things bind Assassins from all ages together and, as it should be, it all comes down to the costuming! The hooded tunic might be a different color and each agent of the shadowed group sure gives their own cultural twist, but anyone in the know will recognize that iconic cowl pulled up, the cloth drapes, or the tool of doom, the hidden blade! 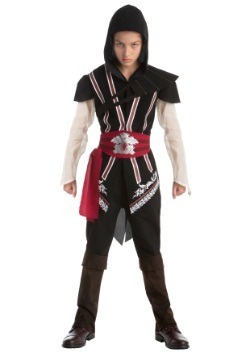 Whether you're flying the black flag of pirates, aiding the revolution, a rogue assassin, or a member of a syndicate, we have the perfect Assassin’s Creed Halloween costume for your favorite historic era! 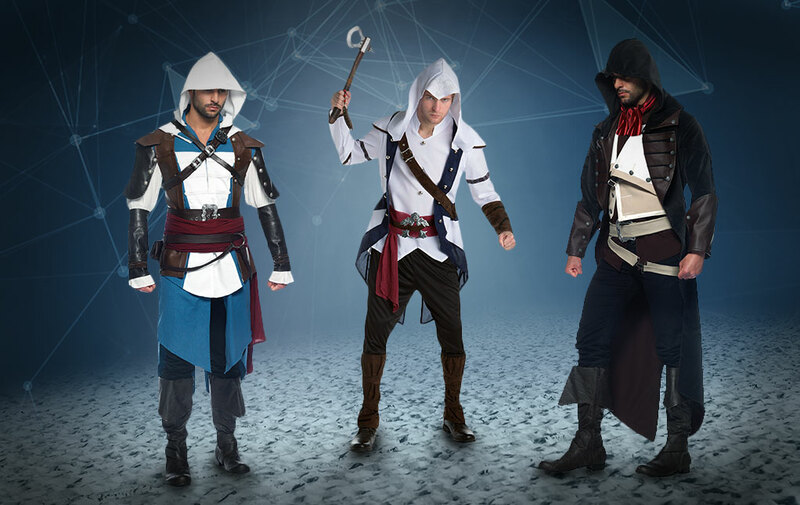 Choose from Connor, Arno, Edward, and more! The job of keeping the world safe from the Templars isn't just a man's responsibility! 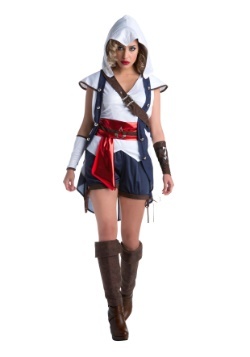 Heck, many of the most skillful assassins in the whole line of the Creed were femme fatales that stole freedom back from the hands of the controlling baddies. Of course, history doesn't always bring them into the limelight, but that's mostly because our Assassin protectors do their best work from the shadows. 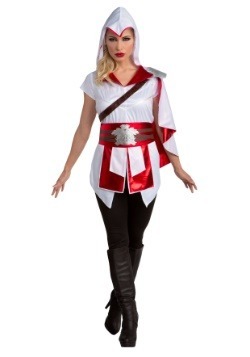 But, by letting the animus do its technological wonders, you can use these women's Assassin’s Creed costumes to give our lady assassins some stage time! Historic times are filled with famous (and infamous) women. Each find ways to walk that thin line between tempting and terrible, darling and dangerous. And since we're already rewriting the forgotten truths of history thanks to the genetic memories and the help of the Animus, we might as well see if there are a few other details that need some proper synchronization. Start up with the major players and set sail for adventure. 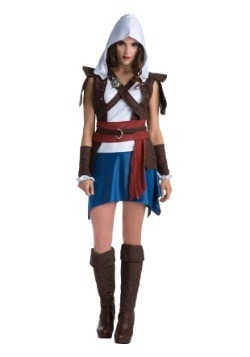 Imagine a female Edward Kenway, that notorious pirate who took a ridiculously long time to accept his role as a hero. Might have happened quite a bit faster if he was a she, don't you think!? And that's just one of many. 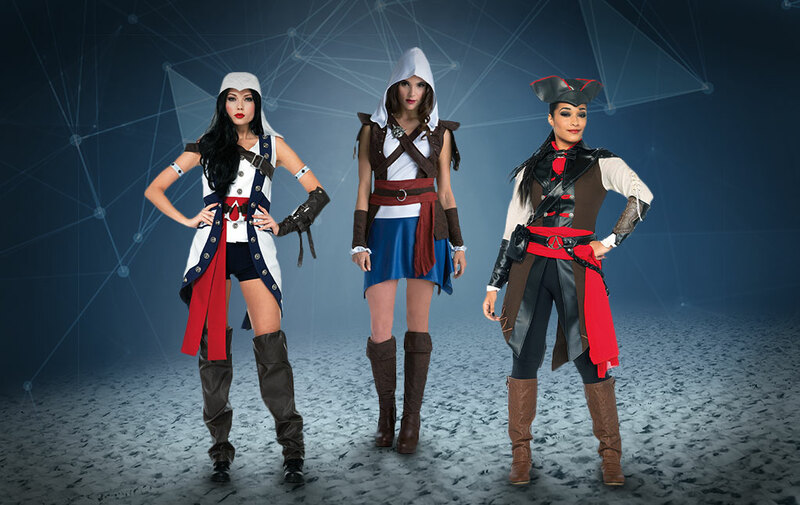 Join the ranks of the Assassins like Aveline de Grandpre, Lucy Stillman, Maria Thorpe, Shao Jun, and Evie Frye with any of these intricate female Assassin's Creed costumes. 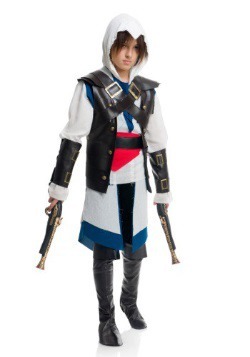 You can also create gender swapped versions of Connor and Edward Kenway with these costumes! Some might argue that the world of plot and intrigue belongs to the adults. But, history lessons are really important. And, despite the fact that Assassin's Creed may seem like just a popular video game, there is a ton to be learned, too! Those Ubisoft folks worked really hard to incorporate an incredible amount of real-world history to blend with those more speculative parts. How about that the whole thing started with an actual guild in a castle in Masyaf or the real buildings in Paris, London, and Rome that you might be jumping around in an effort to synchronize your map? 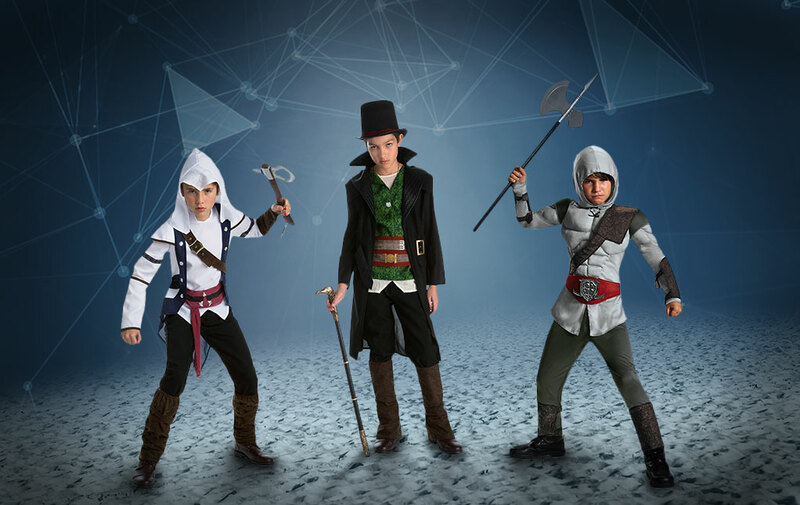 If you're looking for a bit of education to join up with your kiddo's adventures, look no further than here for your Assassin’s Creed costumes for kids! Kids are already going to be super energetic and passionate about the games they play and the imaginative moments that they have. All you may need is to channel that energy into something as extensive and intricate as a historically-inspired video game series with over twenty titles! 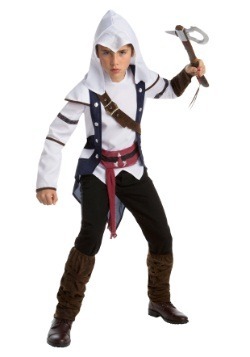 One of the best ways to do that is to let them get some real-life vicarious enjoyment with one of our many youth Assassin’s Creed costumes. You could either go by sheer aesthetic style or think of all the historic choices at your disposal? 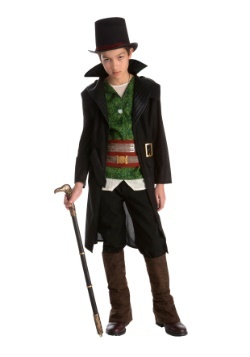 Perhaps your kiddo is super into top hats and that old London style? Well, say hello to Jacob Frye! Maybe you just want to get your tyke to consider Rome for a future holiday or are in serious love of capes. 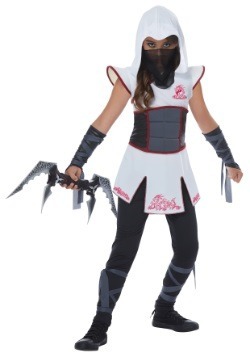 Well, the Master Assassin Ezio's Italian style can't be beat! Where does your tyke want to go today? 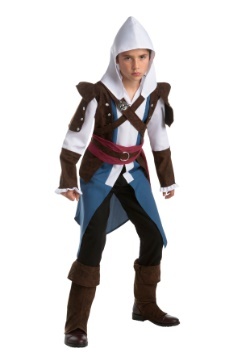 It is probably a little counter-productive to be as well-known as Ezio Auditore is, to be honest. The whole point of being an assassin is to remain hidden from light (like a ninja) so that they can work to bring truths out into the day. Admittedly, it is hard to do that if everyone can recognize you. 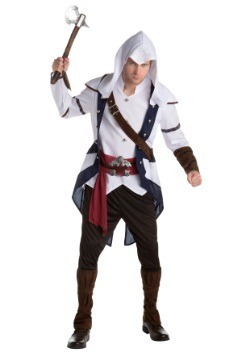 But, since the Renaissance time is well over, you can feel safe showing off the original look of the most popular assassin in history. The whole image is geared to imitate the eagle soaring over the city, using that near magical eagle eye to spot all its secrets. 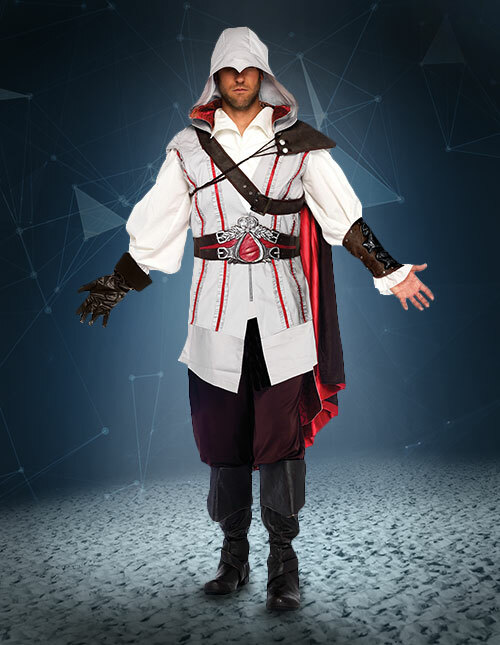 It might be difficult to resist posing with your arms spread in a leap of faith when you wear this deluxe Ezio Costume and feel those authentic Italian Assassin vibes coursing through you. Perhaps the original Ezio and his uncertain discoveries through Florence and Rome aren't enough for you. 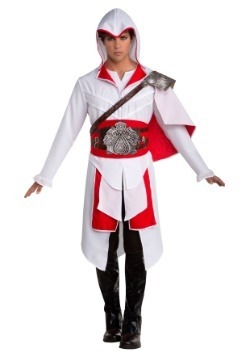 If you're the type of Ezio who has already been all over the country, illuminating secrets from those dark and hidden alcoves, maybe the shining white cloak of his earlier days aren't quite so right. After all, your adventures have gone a little darker. Revelations can do that to a hero, even one like yourself and Ezio (or maybe even a superhero like Batman). When that happens, it is time to adapt and get grittier. Turn in that light for a little darkness as you step towards Masyaf to face those old shadows. 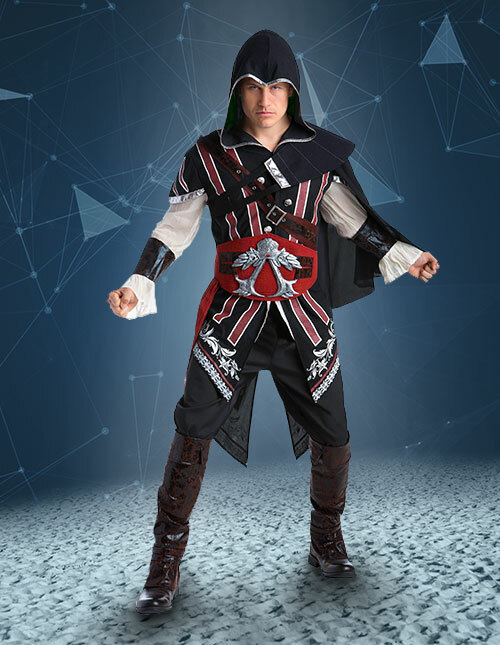 You won't need the wisdom of the precursor races to feel enlightened and refined with the dark and dashing Assassin Mentor look of this Ezio costume for men. Bringing truth to the world isn't just the job of the boys! The Assassins aren't just saying pretty words when they say, "Nothing is true; everything is permitted." This is all about being the builders of our own futures by defining our present. Rejecting the assumptions of the past and revealing the real truths! What better way to demonstrate the Creed than to show that the Master Assassin and Mentor of the Brotherhood might have just as easily created a Sisterhood!? 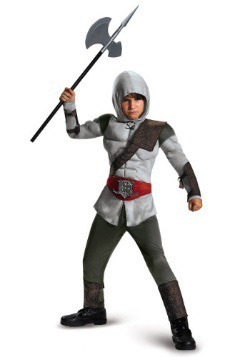 With the same sleek dark tunic and mysterious pose, you can delight all with this choice in Assassin’s Creed Revelation costume. This red sash and black cape were made for a woman and it might just be time for you to show everyone how history really went. Heck, while we're at it, it is worth noting that the motto of our freedom fighters is certainly passed down through the family. (How else could we be tracking all these amazing moments through genetic memory, after all?) What better way to ensure the future for all than to keep that ancient tradition alive with the newest generation as well! 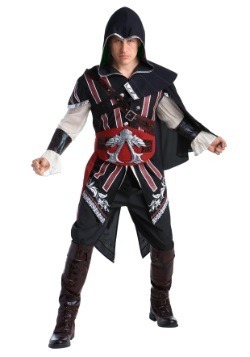 Bring your kiddo along for the adventure whether it is for a Renaissance Festival, a gaming convention, or to secure your trophy in the family category of your cosplay contest with the Assassin's Creed: Revelations Ezio costume for kids. 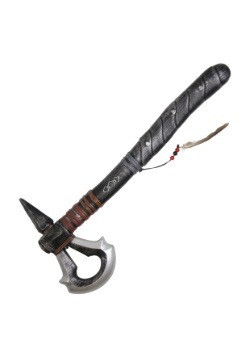 Maybe hold off on the weapon training for a few years. Then again: everything is permitted. Perhaps your kiddo has a future to make today! 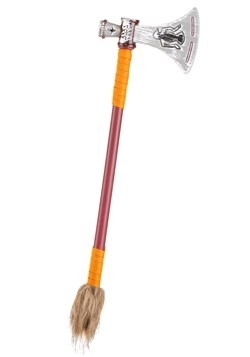 When setting out on the streets of London, either to uncover the mysteries that might be hidden there or to do a bit of rabble-rousing and keep those Templars feeling like they'll never be able to manage all the chaos you cause, it is pretty important to have all the tools you need at your disposal. 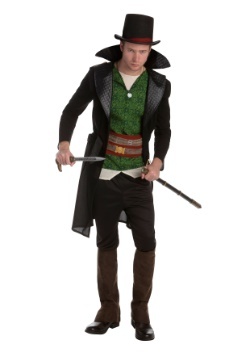 You might be dashing as heck, but can you really convince anyone that you mean business without a weapon at your side? 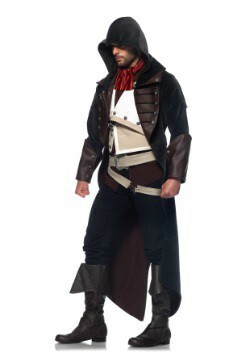 Make your Assassin’s Creed Syndicate costume or cosplay a slashing success. 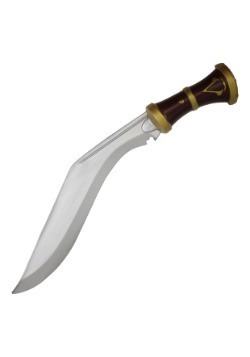 Foam and rigid plastic combine in perfect balance to make this kukri just the thing you need to stop the Templars and find that missing piece of Eden! Sometimes, it is difficult just to know who you are. There's nothing to feel bad about, there! Most everyone spends a huge chunk of their lives figuring out their identity. And, if you didn't know that you were born into an ancient legacy of two different warring factions, each vying for either the control or freedom of the world, well, let's just say that you might have to cut through a whole lot of complicated mess just to start seeing who you truly are! 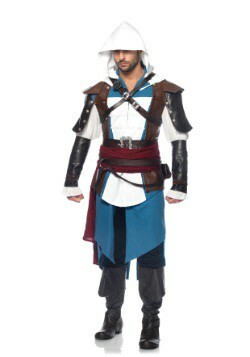 Such is the case of Ratonhnhaké:ton, better known as Connor Kenway. 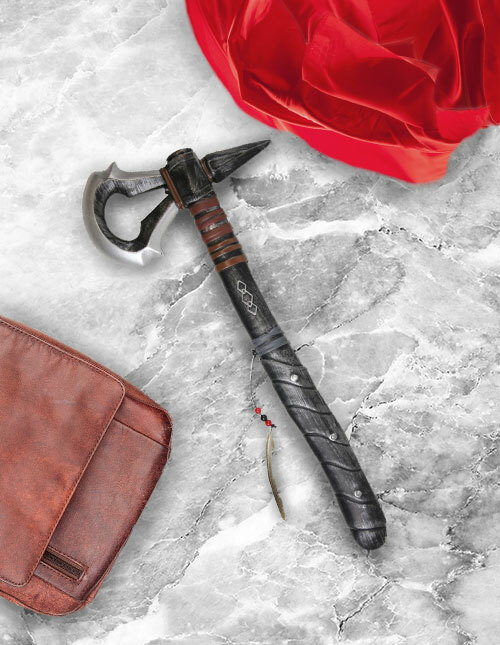 Like him, find the perfect blend of Native Assassin for your costume or cosplay with Connor’s axe whose design is influenced by the Assassin's symbol. One thing that you know is going to happen when you hop into the animus is that you're going to be experiencing all manner of different cultures, times, and styles that completely redefine your idea of fashion, technology, and the perfect moment that the two combine. Now, if you're going to hop into somewhere in the Industrial Revolution of London, expect to see a truly new meaning of refinement. 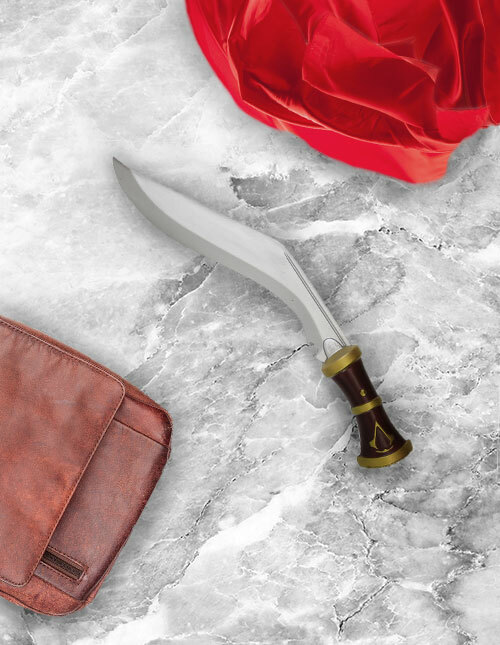 Your Assassin’s Creed Syndicate costume might seem complete with your kukri for all those obvious fights, but you may need a more surprising one at your side, too. 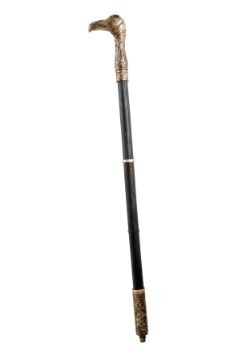 That's where the elegant and noble hidden knife cane can become your best friend! 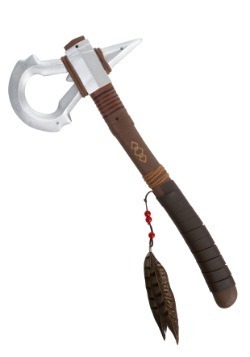 Besides, an Assassin can never have too many weapons. The original assassin wasn't technically the first, though Altair certainly made changes that would ripple through history. (Quite a long history, in fact, since those events took place even before console achievements!) Still, when you're ready to take the oath, you'll be pleased to learn that we can help you do so with elegance, grace, and even keep it safe at the same time. 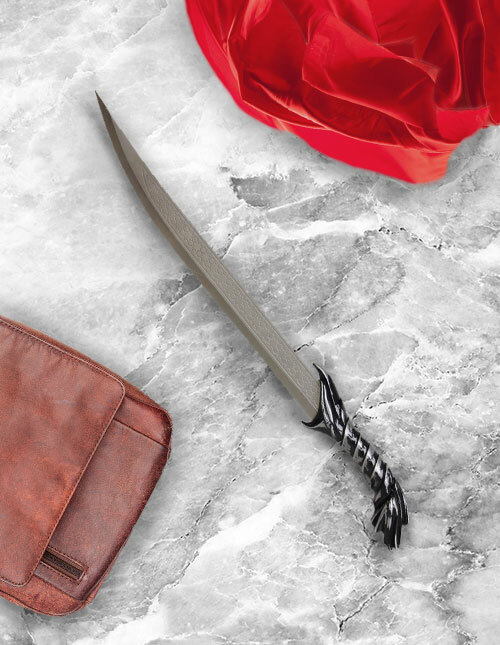 This sleek and slightly curved foam and plastic made Altair dagger is so finely made that your cosplay and LARP opponents might even think they've just been legit assassinated when you remove it from it sheath and stare them down with your original eagle eye. 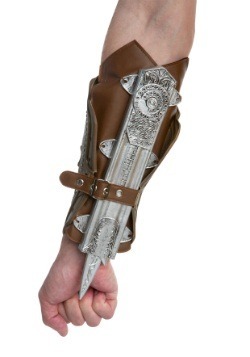 Everyone knows that the game of Assassin's Creed doesn't truly begin until you have finally strapped the most iconic weapon in the arsenal of the secret group to your wrist. 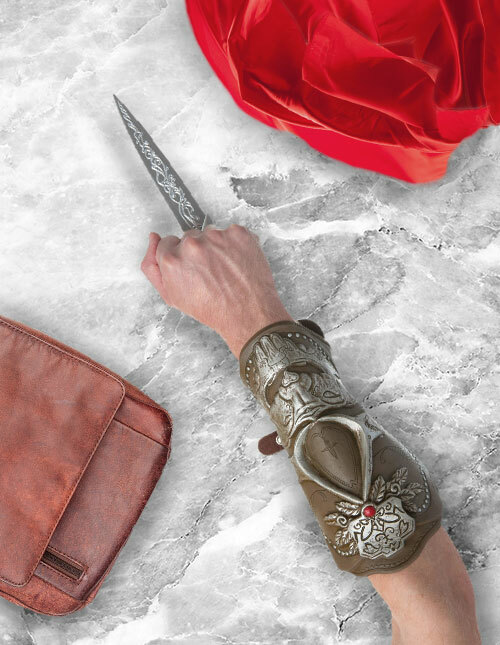 You might have your dagger, axe, swords, and perhaps even an early pistol, but you aren't a true assassin until you have your hidden gauntlet blade ready to help you achieve all your goals. Usually, you'd have to undergo a pretty dangerous quest and prove yourself worthy of this ultimate symbol of the Creed, but we can tell you are ready. Just like the most famous assassin in history, Ezio Auditore, sometimes a novice assassin needs to be named out of sheer merit. 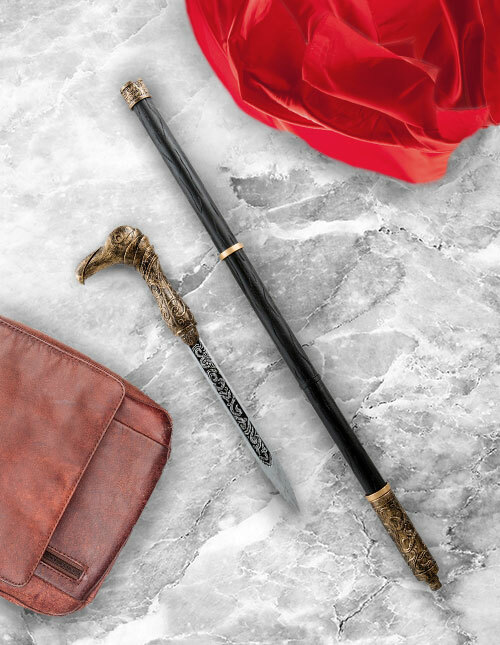 Even though Ezio might be the most recognizable assassin in our repertoire, that doesn't make his style automatically the perfect option. 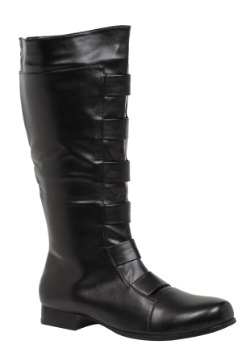 Perhaps the simplistic look isn't quite your style. Maybe you enjoy a little extra stealth in your movements. A touch more danger and edge to your adventure. Maybe the Renaissance realm isn't quite your thing and you'd rather enjoy the taverns or the open seas. 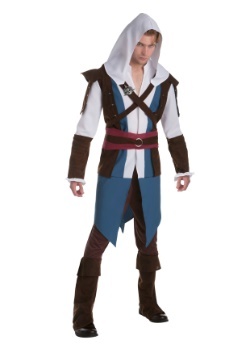 In that case, you can have your striking looks and still have your Assassin goods by leaning more towards Edward Kenway's fashion sense for your Assassin's Creed Black Flag costume or cosplay. 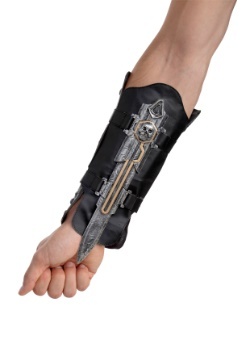 This black leather gauntlet is a guaranteed precision strike. While we definitely recommend giving this video game series an incredible look, we're talking about many titles. You could practically read the actual history books in the time it might take to feel the whole world of Ubisoft's Assassin's Creed series. 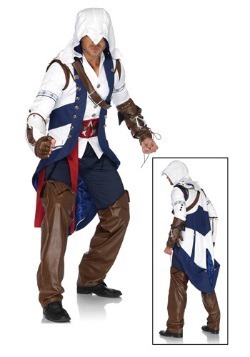 If you're looking to bring history into the present with that flare that nothing but a real to life Renaissance can (or if you're looking to make a major mark on your own Renaissance Festival), the right Assassin’s Creed costume from the original to Black Flag, from Brotherhood to Syndicate, and finally back to Origins might be just what you're looking for. Of course, rather than playing through every delightful hour, you can also have a nicely organized tour through the fashion of each of the epic heroes who have given everything for our freedom. Give us a Leap of Faith and choose your favorite!